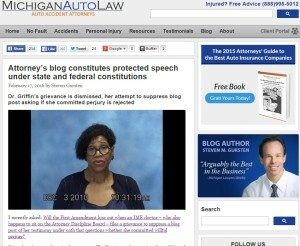 A Michigan lawyer may write about the untruthful testimony of an “expert” medical witness because his online blog post and his comments are protected speech under the First Amendment, officials from the Michigan Bar have decided. That’s good news for the lawyer, who had his law license challenged by the witness─a psychiatrist who also happens to be a member of Michigan’s lawyer licensing board. She had demanded that either his post about her or his license be pulled. Now neither will happen. The case still leaves a lingering odor around that board, the doctor who served as a so-called Independent Medical Examiner (IME), and the process in which she sought sanctions against a legal professional, instead of receiving public condemnation when she got caught, on videotape, fabricating statements about a severely injured plaintiff. Let’s start by clarifying what these parties to the personal injury process really are: The IMEs are hired guns, who can make a lot of money offering their credentials, frequently and repeatedly, to insurers and deep-pocketed defendants. They’re supposed to assist the civil justice system by providing arm’s-length expertise. But they’re little more than hostile, defense witnesses─they’re hardly independent, as I’ve written before. They can do immense harm with their dodgy opinions about ordinary people who suffer devastating injury, say a mom who gets slammed into by a semi-truck and needs care and support for herself and her family for a lifetime. The Michigan case was galling and hair-rising because, if the lawyer hadn’t gotten permission from the court to videotape her examination of the injured plaintiff, she might have gotten away with her wrongful testimony. A badly injured plaintiff might not have gotten his just due. The lawyer would have been in deeper distress when she pulled her nefarious stunt of filing a formal complaint against his license, as I wrote recently. As it is, the lawyer ended up spending time and money to defend himself against her charge; he had to or he could have lost his license─a career wrecker for an attorney. The only glimmer in this disgraceful instance may rest in the licensing board’s finding that lawyers’ blogging, and especially about so critical a societal concern as the proper functioning of the civil justice system, is protected under the Michigan and United States constitutions. I joined with other legal colleagues and commentators in noting that the doctor, had she pursued civil litigation against the lawyer, such as a defamation lawsuit, would have faced huge hurdles in the courts: Judges, for First Amendment reasons alone, look askance at public figures suing others to constrain free speech, especially discussion about conduct of their public duties. At the same time, as officers of the court, lawyers are expected to uphold legal institutions and to use due care in discussing colleagues and cases. Cocktail party jests aside, lawyers must abide by high ethical standards to keep our system functioning well; these can clash with their First Amendment exercise. But, speaking of ethics, that’s the missing piece of this matter for me: This witness has such a poor track record that lawyers in the area have conducted sessions on how to work around her. She got caught and called out for lying in her testimony. 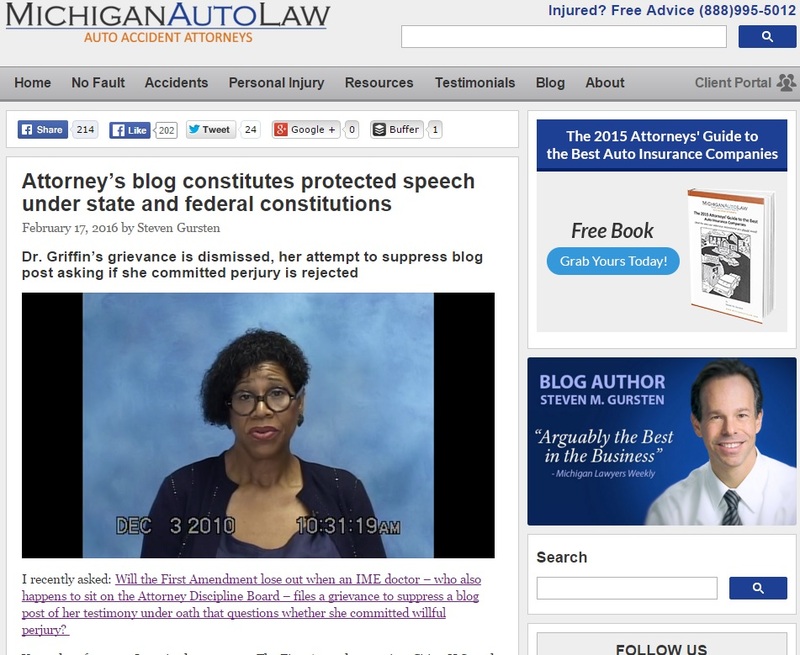 She attacked a lawyer’s license but had her claim slapped back, and relatively fast. Based on some of the attorney’s other blog posts, it appears that there are some real hurdles and problems due to local and state rules for lawyers in Michigan in dealing with, and especially in disqualifying IMEs. That should not stop my colleagues in the Michigan Bar, however, from asking themselves some common sense questions: What is this IME doing on the state lawyer licensing board? What credibility does she bring now to testify as an expert? And isn’t past time to ask whether the IME system needs a real, robust reconsideration, top to bottom? The public needs to know that this is happening. The public needs to know about the enormous harms that far too many IME doctors are causing to people when they sacrifice their professional integrity for insurance company cash. I will continue to speak out against this. I hope other attorneys will now speak out against this and other important issues that impact the public as well, hopefully knowing that we have the same rights to protected speech under the First Amendment as everyone else.